Business 2.0 has a look at "the next disruptors" which includes a company called Bloom Energy working in the distributed energy / cogeneration / fuel cell area. These are a little like the building oriented energy storage devices that Richard Smalley's original smart grid vision called for - unfortunately, they require hydrocarbon fuels, so while they are a good step forward, they don't take us as far as we need to go (even a solar/wind powered hydrogen generator / fuel cell combination would be slightly better than this). Their "bonus round" of innovative companies is more interesting than most of their main selection from an energy point of view, though soy bean based biodiesel would be best kept to fairly small scale production). Making electricity in central power plants is so 20th century. K.R. Sridhar has a better idea: Create energy on the spot, right where it's consumed. His startup, Bloom Energy (formerly known as Ion America), is developing a fuel cell that could kick-start the distributed-energy industry. The problem with today's centralized approach is its vast inefficiency. In coal-and gas-fired power plants, almost two-thirds of the energy produced by converting fuel into kilowatts escapes as heat. Another 8 percent, on average, dissipates as the electricity travels over transmission lines to get to your home. Sridhar, a former aerospace engineering professor who developed a device for NASA to turn carbon dioxide into oxygen on Mars, is undaunted by big challenges. His plan for generating energy locally is to use solid-oxide fuel cells - a concept that has been kicking around since the 19th century but is now becoming practical with advances in the ceramics needed to build the things. Bloom's cells, still in development, are constructed around a ceramic core that acts as an electrode. At high temperatures, fuel on one side attracts oxygen ions on the other. As these ions are pulled through the solid core, the resulting electrochemical reaction creates electricity. Such a fuel cell can run happily on almost any hydrocarbon fuel - ethanol, biodiesel, methane, natural gas. Though it consumes hydrocarbons, Bloom Energy's fuel cell does not require combustion and therefore produces half the greenhouse gas emissions of more conventional energy sources. One of its by-products, in fact, is hydrogen that could be used in a different type of fuel cell, the hydrogen-powered version imagined for propelling cars. Bloom Energy's biggest hurdle is cost. The company needs to get the price of the machines below $10,000 apiece. At that level, they could pay for themselves in five years. (Solar panels take twice as long to recoup their capital expense.) "For it to reach mass-scale adoption, that has to be the goal," Sridhar says. "Otherwise, you are playing in a niche market." Want more? We've discovered that there's no shortage of startups out there with industry-shaking potential. Here are five more ventures that could prove just as disruptive. The leading battery technology - lithium-ion - has not changed in a decade. A123 holds patents for smaller, lighter lithium-ions with significantly longer lives. A123 batteries are installed in hybrid buses worldwide and will enter consumer hybrids in 2010. Biodiesel delivers around 50 percent more miles per gallon than ethanol. REG, an offshoot of an Iowa farm co-op, makes biodiesel from soybeans. It has 40 percent of the market and a distribution deal with Safeway. The cost of rapid prototyping machines is already plummeting. (See "3-D Printing for the Rest of Us," page 46.) Now San Francisco startup Desktop Factory is set to bring out a $5,000 3-D printer, undercutting competitors by 75 percent. Sure, compact fluorescent lightbulbs are energy savers, but they also contain mercury. Cree is the leading maker of light-emitting diodes, which are less hazardous and even more energy-efficient. Toronto and Raleigh, N.C., are already installing Cree LEDs in streetlamps and parking garages. It isn't just Third World kids who will benefit now that Nicholas Negroponte's venture is producing its $176 laptops. The machine's innovations, such as Wi-Fi mesh networks and a power system that consumes 90 percent less electricity than standard laptops, could affect the rest of the industry. Two weeks after the U.S Environmental Protection Agency warned that server farms could double their energy consumption over the next five years, Sun Microsystems today unveils a green data center that has resulted in a dramatic decline in electricity use. Deploying new server technology and state-of-the-art cooling systems, Sun (SUNW) consolidated its Silicon Valley data centers, halving the square footage while cutting power consumption nearly 80 percent. Although Sun reduced the number of servers from 2,177 to 1,240, computing power increased 456 percent, according to the company. Last week Sun gave Green Wombat a sneak peak at its Santa Clara campus's next-generation data center. Through virtualization - enabling one server to do the work of multiple machines - Sun slashed the number of computers in the data center and the heat they generate. Sun has invested in smart cooling technology to reduce the considerable energy the typically goes to cool hot-running servers. For instance, in one data center room on the Santa Clara campus, servers are arrayed in long black pods called hot aisles. Hot air from the machines blows into the interior of the closed pod where it is captured by heat exchangers. (The visual effect of the stark white room and rows of black server pods is something of a cross between 2001: A Space Odyssey and the Borg.) In a traditional data center, each server rack might consume much as 2,000 watts and produce a lot of heat, says Dean Nelson, Sun's director of global lab and data center design services. The hot aisle server racks in contrast need just a fraction of that power. He points to displays in each rack that monitor the temperature of individual servers, allowing the network to distribute cooling where it's needed. As we head toward the exit, the noise level drops as the cooling system has been automatically turned off in those pods where servers aren't operating. "In a traditional data center the air conditioning would be blasting the entire center all day long," says Nelson. If all this is good for the environment and contributes to the fight against global warming - the consolidation will eliminate 4,100 tons of carbon dioxide a year, according to the company - it's even better for Sun's bottom line. By shrinking the square footage needed to house its servers, Sun avoided spending $9.3 million on new construction. Company executives say the investment in the new data center will pay for itself within three years. And by taking a load off the electricity grid, Sun earned a $1 million incentive payment from local utility Silicon Valley Power. Sun has also opened green data centers in India and the U.K.
GreenSource magazine has an interview with Bruce Sterling about his book "Shaping Things" - "Betting On The Future". GreenSource: In Shaping Things you offer a provocative vision of the evolving relationship between people and objects and the role designers can play in promoting a more sustainable future. How does this vision apply to buildings and the built environment? Bruce Sterling: My book is a speculation about “ubiquitous computing in the service of sustainability,” the central notion being that an ‘Internet of Things’ might make the flow of resources greener. The one thing that unites modern building designers is that they’ve all got computers, and they’re all on the Net. They all share a certain platform now: that’s a tremendous change, it’s a revolution. It seems plausible that the digital network will move out of virtuality and into physicality: ambient computing, the 3D Web, physical computing—the idea is so obvious that it’s been reinvented and renamed many times. Still, nobody knows how today’s professions would go about dividing up that frontier and developing it or what would be left of today’s professions if they succeeded at such a thing. Basically, it’s a question of who’s-more-advanced-than-thou. Some professions were faster at finding and leveraging the early Web than others, but the race is by no means always to the swift. GS: Shaping Things describes scenarios in which a virtual representation of an object is more useful than the thing itself. In architecture, a trend toward building information modeling (BIM) design tools promises that someday designers will get instant feedback on the energy loads and other performance parameters of their buildings while they are still virtual models. How might this trend change the design and performance of buildings? BS: That trend is about metrics. It’s very hard to improve what you can’t measure. If you do have metrics, you can tweak them and watch the results. You can do rapid prototyping of virtual buildings. You can generate thousands of virtual models and search them for top performance. When it comes to the management of the built environment, by using metrics you can see if there are sweet spots in the system. Are people on the top floors too hot, throwing open windows, sucking cold air in the ground floor and causing the people below them to turn up the heaters even higher? If you have instant feedback on energy loads you can see things like the “chimney effect.” You can design and construct and sell buildings that give their inhabitants a higher quality of life. Not just cheaper or greener or safer but higher. The point isn’t to make them more like a Windows operating system; the point is to make them more like buildings. GS: In comparing building materials, designers would like to be able to rely on the field of environmental life-cycle assessment (LCA), in which environmental inputs and burdens associated with a product are quantified. But LCA is currently hampered by concerns about inadequate data and unreliable (biased) data sources. Will LCA data become ubiquitous and reliable? BS: A life-cycle assessment system has to be a work in progress. It has to be a live thing, like Wikipedia. It’ll never be a Chinese-menu check-out system where the choices are cut and dried. Asbestos used to be considered a major health benefit: asbestos stopped people from catching on fire. You look at asbestos a little longer, you figure out, hey, it’s not a great idea breathing that stuff. If your LCA system is cast from solid litigation-proof pig iron, you will never be able to advance your profession. You’ll be forever stuck with yesterday’s limited answers. What we need is not a final textbook answer on what’s safe and allowed, but a better general interface for advancing tech development. GS: In green buildings, there exists a tension between those who advocate low-tech, natural, or indigenous materials and those who believe in high-tech solutions for low-impact buildings. Is one approach better for the future? Time has an article on flying and global warming. Given the rage that air travel can provoke in even the most tranquil among us these days, it may be surprising that riot police aren't a more regular feature at airports. But Sunday's pitched battle between roughly 500 environmental activists and a phalanx of baton-wielding police at London's Heathrow airport wasn't about long lines, delays, lost luggage or missed connections. Instead, the protesters — who had demonstrated outside Heathrow all of last week — were trying to draw travelers' attention to the impact on climate change of the carbon gases emitted by the aircraft in which they fly. A placard from one activist at Heathrow expressed it thus: "You Fly, They Die." Airplanes operate on petroleum fuel, which means they release large amounts of carbon dioxide when they fly. Commercial air travel is currently responsible for a relatively tiny part of the global carbon footprint — just 3.5% of total greenhouse gas emissions, according to the Intergovernmental Panel on Climate Change. But the unique chemistry of high-altitude jet emissions may produce an additional warming effect, while the explosive growth in air travel makes it one of the fastest-growing sources of carbon gases in the atmosphere. And unlike energy or automobiles, where carbon-free or lower-carbon alternatives already exist, even if they have yet to be widely adopted, there is no low-carbon way to fly, and there likely won't be for decades. "It's not so much where we are now, but where we'll be in 30 years' time," says Peter Lockley, head of policy development at the Aviation Environment Federation in London. "We need to bring global carbon emissions down rapidly, but this sector is just going to grow." And grow. The Airports Council International estimates that the number of airline tickets sold per year will double to more than 9 billion by 2025. Much of the growth will come in rapidly developing Asia, where passenger numbers are increasing by 10% to 15% annually. The already badly overburdened Heathrow — the busiest airport in Europe — is pushing to open up a third runway by 2020, a move that touched off last week's protests. Swissinfo notes that "Peak oil is becoming a burning issue" in Switzerland - the article features Daniele Ganser, who wrote the book on Operation Gladio - "NATO's Secret Army". Swiss scientists say politicians and the public should have a greater awareness of "peak oil" – the moment when the world's maximum crude oil output is reached. Researchers at Basel University warn that although climate change is grabbing more headlines than the possible exhaustion of fossil fuels, a conflict is brewing over crude oil. "The question is not for how long we will have crude oil reserves, but for how long output can grow," warned Daniele Ganser, a historian and peace researcher at Basel University, who says the significance and explosive nature of the issue is underestimated by politicians and the public. No one can agree on when exactly the moment of "peak oil" will be – some experts say 2010, others say 2020 or 2030 – but it is a serious problem as crude oil output has grown for decades and positively boomed with the industrialisation of the emerging nations. An end to the spiral is not in sight and once the global peak is reached, a further increase is simply not possible. "Conflict over crude oil will increase in proportion with its scarcity – the global economy is facing a recession," said Ganser. "We are running to the oil limit without thinking. 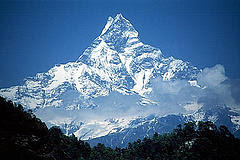 It's as if we planned to climb the Matterhorn to get to the summit at midnight, leaving it much too late to descend." Ganser says the issue of peak oil is barely a topic in public debate because it is not immediately visible. "If oil supplies run low, they are imported," he said. "That also goes for the oil-producing countries that have already reached the peak." A switch to gas or coal is not a solution, according to Ganser. "These energy sources are also finite and will one day reach their maximum output. It would therefore be wrong for Switzerland to turn to gas power plants." Ganser points out that as early as 1978 Switzerland had defined the containment of crude oil dependency and the promotion of renewable energy types and efficiency as goals in its energy concept. McClatchy Newspapers reports that Prices for Key Foods are Rising Sharply. The Labor Department's most recent inflation data showed that U.S. food prices rose by 4.2 percent for the 12 months ending in July, but a deeper look at the numbers reveals that the price of milk, eggs and other essentials in the American diet are actually rising by double digits. Already stung by a two-year rise in gasoline prices, American consumers now face sharply higher prices for foods they can't do without. This little-known fact may go a long way to explaining why, despite healthy job statistics, Americans remain glum about the economy. Meeting with economic writers last week, President Bush dismissed several polls that show Americans are down on the economy. He expressed surprise that inflation is one of the stated concerns. "They cite inflation?" Bush asked, adding that, "I happen to believe the war has clouded a lot of people's sense of optimism." But the inflation numbers reveal the extent to which lower- and middle-income Americans are being pinched. The Bureau of Labor Statistics said in its July inflation report that egg prices are 33.7 percent higher than they were in July 2006. Over the same period, according to the department's consumer price index, whole milk was up 21.1 percent; fresh chicken 8.4 percent; navel oranges 13.6 percent; apples 8.7 percent. Dried beans were up 11.5 percent, and white bread just missed double-digit growth, rising by 8.8 percent. John Howard's 1950's energy policy of supporting coal mines over clean technology industries has had another casualty, with Danish wind turbine manufacturer Vestas closing their last Australian plant. One day in the not too distant future the rest of the world will introduce carbon taxes and Australia will be a legacy economy thanks to our backward looking leadership. A major world supplier of wind farm technology has been forced to turn its back on Australia because, it says, the green energy market is unviable. Vestas Australia Wind Technology will close its Portland turbine blade factory at the end of the year because it is not profitable. One hundred and thirty jobs will be lost, with the closure casting major doubt over the viability of Australia's renewable energy industry. Vestas says it could no longer justify keeping the plant open because the investment was not worthwhile in the Australian market. "It's definitely a fact that the current environment for the wind industry is not big enough to encourage these kinds of investments," Vestas Asia-Pacific senior vice-president Jorn Hammer told AAP. "We have the view that if the government steps up to the plate and puts the necessary security for a long-term market in place we'll have another look at the market, but I guess we'll be a little more careful next time. "(Not) just believing in what they've been telling us, we need to see some hard evidence to justify investment." The federal government has set a two per cent renewable energy target, labelled "pathetic" by Greenpeace which says it is not enough to encourage a green power industry. Labor and the Australian Workers' Union (AWU) have also blamed the government for the Vestas closure, accusing Canberra of stifling the industry. The Danish-based company last year closed a similar $15 million factory in Tasmania, laying off 65 staff. The Wynyard plant, near Burnie, 345km north-west of Hobart, operated for three years, manufacturing blade hubs and nacelle components for its wind turbines. Mr Hammer said the plant closed for the same reason the Portland factory was shutting down. The Portland operation opened two years ago and produces export turbine blades. Vestas had hoped to invest in new technology to develop blades for the Australian market but could not justify the outlay, Mr Hammer said. After Gutenberg has a post on the "Green Cowboy" and his efforts to educate people about the "three poisons". We need to wean ourselves from oil, coal and nuclear to have a future. Freeman says that with existing technologies we can meet the nation’s electrical needs. Renewable energy resources, i.e., solar, wind and biomass energy, harnessed on a mass scale, can heat and cool our homes, run our cars, power our factories, and do all the things that our civilization requires. He calls for a concerted 30-year effort to close aging coal-fired and nuclear power plants. “The folks who sell oil, coal, and nuclear reactors spend tremendous amounts of money convincing the American people that what they sell is economical, safe, and clean. They contribute huge sums of money to the politicians who repeat their propaganda. How often have you heard phrases such as ‘clean coal,’ ’safe nuclear power,’ ‘clean diesel,’ or ‘low-level radioactive waste’? “These phrases are images invented by highly paid, highly skilled advertising firms. But, these claims are lies. 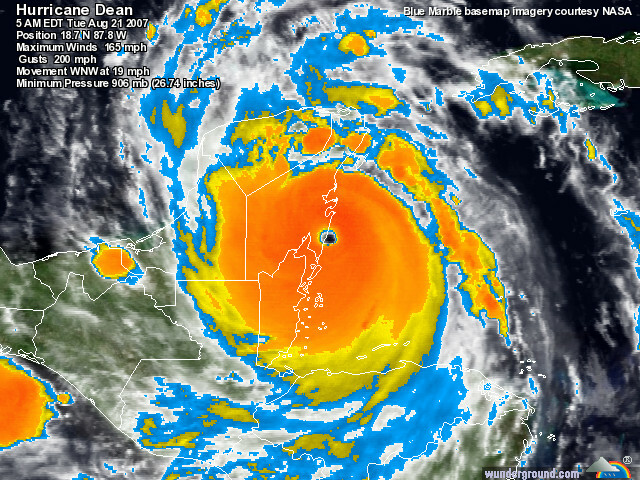 Chris Mooney has a post on Hurricane Dean and global warming. All American Patriots reports that Dennis Kucinich has Blasted The Bush Administration For ‘Setting The Stage’ For War With Iran. “Not only are they ramping up their attempts to lie and deceive this nation into another war, they are also using those lies and deceptions to justify creating a police state right here where everyone is under suspicion and everyone is secretly under surveillance from Big Brother in the sky,” Kucinich charged. Kucinich was responding to two separate reports since yesterday: one that the Bush Administration is planning to designate Iran’s Revolutionary Guard as a terrorist organization, and the other that The Bush administration has approved a plan to expand domestic surveillance using spy satellites and aircraft sensors that can see through cloud cover and even penetrate buildings and underground bunkers. This kind of technology has been largely restricted to foreign surveillance. “These are people,” Kucinich said, “who don’t understand what civil liberties are, what the Constitution represents, or what democracy is all about. What they are doing is despicably un-American and a violation of their oath to uphold and defend the Constitution and laws of the United States of America. Turning our own military assets against our own people is a flagrant violation of everything this nation stands for and a crime against our citizens.” Kucinich said. * The Oil Drum - Saving 20 million barrels a day. The 100mpg hybrid car should be here, now! * TreeHugger - Surfs Up, Green Dudes! * Crooked Timber - A Perpetual Declaration Of War. "Tthe United States and the world would be better off without the US Foreign Policy Community". * Beyond The beyond - America: Neck-Deep in Netwar, And Losing. "(((Heard a good American story lately? Me neither.)))". * Beyond The Beyond - Neck-Deep in Netwar II: The Coming Urban Terror by John Robb, City Journal Summer 2007. I always think of Bill Joy when I read these type of posts. * Beyond The Beyond - A Soviet Poster A Day. "(((With the passage of time they look less "Communist" and more simply "twentieth-century"... charming, historical "atompunk" details like electrification, smokestacks, railroads, cigarettes, manned space flight....)))"
* Toronto Star - Police accused of using provocateurs at summit. * Daily Telegraph - Fears over APEC chaos plan. Large anarchy symbol on the front page of the Daily Terror today. I guess Osama is out of fashion these days - these days the phantom menace is schoolkids and Critical Mass bike riders. Be afraid ! I can see why it is important to demonise any protesters that show up in advance, poor besieged Dubya might catch a glimpse of a few 14 years old complaining about the million dead Iraqis left in his wake from his hotel window. * Alternet - Father of Mysteriously Murdered US Soldier in Iraq: "Why Cover Up A Crime Like This?" * Atlantic Free Press - Dennis Kucinich: Desapparacido! A little piece of tinfoil that wasn't.